This past Saturday was September 1st! Hogwarts is full once again with bright young witches and wizards, and I was full of pastries. 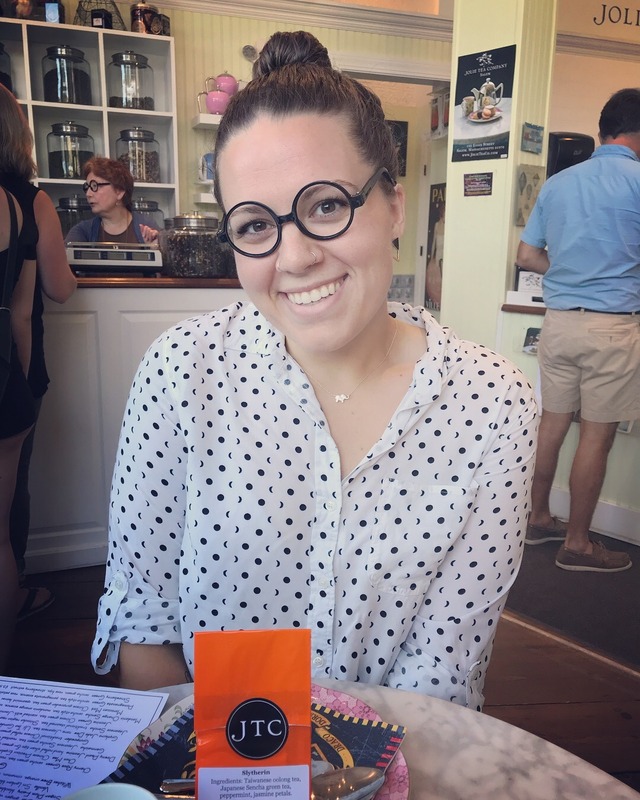 My absolute favorite tea shop ever, Jolie Tea Co. in Salem, hosted a themed high tea on Saturday featuring their new Harry Potter tea line, and it was the most magical thing ever. If that sounds super exciting to you, but you’re sad you missed out on it, I’ll also be teaching a Harry Potter themed yoga workshop (10/19, 7PM-9PM) at Barefoot Yoga Shala, and Jolie will be donating Harry Potter tea for it! I’ve linked it there, and you just need to scroll down (past all the other amazing workshops) to find Harry Potter: Yoga, Tea, and Me. It’s going to be a Weasley good time. High tea was wonderful. I went with my friend, Alex, and we were treated to little round glasses, Hogwarts house themed napkins, little samples to take home, and a raffle for a wand! And of course I wore the glasses for the entire thing, duh. Seriously, though, high tea at Jolie is where it’s at. I’ve already scheduled my next one, and I simply cannot wait. I got to try the chocolate chip scone this time, which I never have because I can’t convince myself not to get the lemon one, and it was delicious! The macaron was the new chocolate berry one, too, which I was so happy to try since I haven’t yet. Also simply decadent. The cucumber sandwiches still remain my favorite, both because they’re scrumptious and because they always remind me of Oscar Wilde. The staff was all wearing Harry Potter merch, it was a beautiful day, and everything was right in the world. And now, without further ado, let’s hear about the teas! They’re done in the order that I drank them. Oh man, this was good. This was everything I was hoping for in the Slytherin tea. It was smooth, and I felt very dignified while drinking it. I wanted to be wrapped up in a cold dungeon with snakes at hand and a haughty tilt to my head. I was also reading it while reading the next book in The Queen’s Thief series, which just goes so well together–thieves and deception. It was just so smooth, that’s the only way I can think to describe it. It felt like (this is going to sound so weird) drinking Lucius Malfoy’s voice. But you know how he talks in such a regal, I’m so rich, stuffy kind of way? That’s how this felt going down. Like, of course you can convince me of anything as long as you keep talking like that. I very much think I’m going to come out of this with the Slytherin tea as my favorite. Another perfect one! This gave me a ton of energy while I was trudging back to work after a three-day weekend, and I drank it while wearing this stunning black jumpsuit with dark red lips, so I felt extra–well, Extra. Ravenclaw tea while I look like I could conquer the world? The perfect combination. But, at the same time, it also felt like I very easily could have been drinking this on a chilly Sunday morning with a blanket in my lap and a book. To be fair, it has a lot of my favorite things in it–black tea, lemongrass, blue cornflower, lavender–bring it on. I really appreciate, too, that each of the teas seem to have the color of their respective house, and even when you just look at their ingredients, it’s like, ah yes that makes sense. Peppermint for Slytherin? Duh. Lavender for Ravenclaw? Double duh. Dandelion leaf for Hufflepuff? Of course. The most obnoxious and bright sounding list of ingredients for Gryffindor? Holla. I’ve yet to talk about the actual taste, I realize. This one, too, was very smooth, very calming, very lovely. I was so sad when it was gone. I swear, these remind me so vividly of their respective houses, it’s wild. I know I said it above in the Ravenclaw one about the ingredients, but I really did 100% imagine myself outside in a field of flowers with a little snack nearby when I was drinking this one. Like. Guys. These teas are insane, I love them so much. The Hufflepuff one just makes me feel like everything is good. Everything will work out. I’m gonna go pick some daisies with a plum in my pocket and, like, just chill. It’s all good. It was bright like sunshine peeking out from behind the clouds. It was soft like reading Keats in the grass under a yawning tree. It was just lovely. My soul feels fed. I honestly felt like every single sip was a different tea. It was crazy in the best way possible. At times, it reminded me very quickly of coffee, but not in that overpowering oh gross I’m going to die if I drink this kind of way, but almost in a this tastes like how I imagine Sirius Black would. YES! THAT’S IT! The Gryffindor tea tastes like Sirius Black! Which is to say that it doesn’t taste anything like what I thought the Gryffindor one would, and I am very, very excited about this. I’ll admit, I thought Gryffindor was going to just out of control, but it’s actually kind of dark and mysterious and makes you go back for another taste. It’s commanding is what it is, and it’s bold in a very unexpected way, which I think perfectly describes Gryffindors. And that’s the tea! Perhaps it’s time to reread one of the books? Next Next post: KING OF SAINTS is done! They were! And so surprising in all very unexpected ways, which almost made them better. They were so delightful! The shop has also done an Alice in Wonderland set, and they do seasonal ones & individual-themed ones (my favorite is the Secret Garden).